To understand value stream mapping, we need to first understand what a “value stream” is. Simply put, a value stream is a series of steps that occur to provide the product or service that their customers want or need. In order to provide the product or service that the customers desire, every company has a set of steps that are required. Value stream mapping enables us to better understand what these steps are, where the value is added, where it’s not, and more importantly, how to improve upon the collective process. Value stream mapping (VSM) provides us with a structured visualization of the key steps and corresponding data needed to understand and intelligently make improvements that optimize the entire process, not just one section at the expense of another. There are some tips to creating a VSM for your organization. 1. Define a value stream. Include all the activities required to bring a product from “raw materials” into the customer’s hands or provide service to a target audience. 2. Base the value stream map process on customer requirements. 3. Capture the process as it operates now, not how it’s supposed to operate. A process that worked well when you had 20 employees may not perform as efficiently now that the business is a 200-person company. Be sure you map the process as it happens now, not the way it used to work—or how you wish it worked! 4. Assign a value stream map manager to lead the mapping effort. Input from team members and stakeholders is important, but appoint (or elect) one team member to draw the entire value stream map. This ensures that the manager understands the material and information flows. 5. 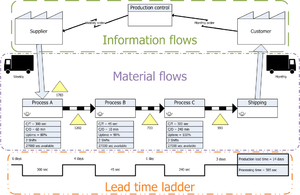 Walk through the process to ensure that the flow of materials and information is accurate. Make sure your map reflects the reality of the process—verifying this by following the process from start to finish can reveal crucial details you might have missed. 6. Focus on one small step at a time. Make sure you capture each step accurately. For example, don’t trust the clock on the wall to measure cycle times—use a stopwatch. 7. Identify critical paths and bottlenecks. 8. Create a future state map from the current state map. 9. Limit the improvement plan to achieve the future state to a one-page document, if possible. 10. To implement the improvement plan quickly, focus on individual areas. Value stream mapping provides a great way to make changes and improvements to the process without doing so at the expense of other processes. Creating a value stream map of the current state of your process helps you focus on areas of waste such as excess inventory, non-value-added time, and multiple operators. If we don’t understand the current process, we can’t really make intelligent decisions about how the future current state might or should look. At the end of the day, the goal is to develop a corporate culture that provides the best possible product to meet or exceed customer needs and expectations. This is ultimately done by making continual improvements to the value stream. As our customers’ needs and expectations evolve, so also will our value streams need to change and constantly evolve.